What's this? 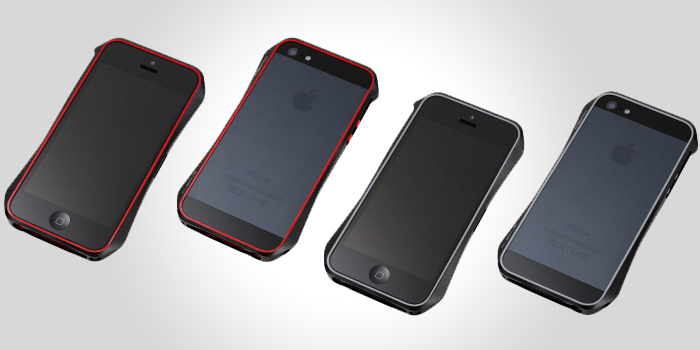 A new and slightly more improved Deff Cleave aluminum bumper case, a.k.a the Draco 5 in North America. It's an unreleased Japanese model that'll soon be available world wide. The Cleave Aero by Deff is the same three-dimensional and insanely curvy CNC machined aluminum bumper as the Draco 5, with one difference in that it features a TPU bumper on the inside that'll provide better shock-absorption and complete isolation from metal on metal contact. Each Cleave Aero comes with one red and one gray thin inner TPU bumper that you can see forms a parameter around the front and back sides of the iPhone 5 while also serving as the Aero's volume and power buttons. Gone are the integrated metal buttons and the silent switch. Deff claims the new design of the Aero will not interfere with signal reception. It's an interesting new look for the Cleave and soon to be Draco Aero that will let users color-customize their bumper straight out of the box. There will only be two color options including a white colored Aero called the Luxury that features a glossy powder-coat finish that closely resembles that of a car's paint finish, and a matte anodized black Aero dubbed the Dark Knight. As for price, the Aero will go for around $90 when released in North America.